London marathon co-founder John Disley has died at the age of 87 after a short illness. Disley, from Corris in north Wales, and his friend Chris Brasher set up the first London event in 1981. The British pair met in the 1950s when competing in the 3,000m steeplechase - Disley taking bronze at the 1952 Olympic Games and Brasher gold in 1956. A former vice-chairman of the UK Sports Council, Disley was appointed a CBE in 1979 for his work in outdoor education. Disley is regarded as the first world-class British steeplechaser, and lowered the British record for the 3,000 metres event five times at the peak of his career in the 1950s. However, he didn't take up athletics seriously until he arrived at Loughborough College in 1946 and met his mentor, the tutor and athletics coach Geoffrey Dyson. Disley was tipped for gold at the Olympics in Helsinki and twice broke the British record but could manage only third place in the final behind American Horace Ashenfelter and the Soviet Union's Vladimir Kazantsev. Four years later it was his friend Brasher - ranked number three in Britain - who took the gold in Melbourne with Disley finishing sixth. They were involved in another race 31 years later in 1979. This time it was the New York marathon and they were so impressed they determined to set up a similar event in London. 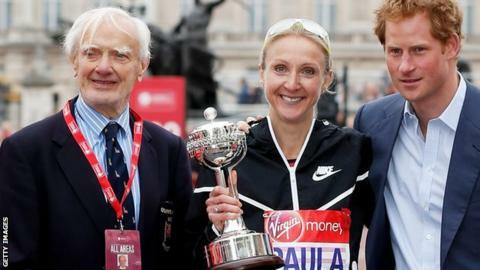 The pair convinced the Greater London Council, the police, the City of London, the Amateur Athletics Association and London Tourist Board to back the event. And after securing a sponsorship deal to cover any potential cash shortfall, Disley and Brasher staged the first London race on 29 March 1981, with 7,474 runners taking part. In 2015, a London record of 37,675 runners finished the race. Disley continued as president of the London Marathon Charitable Trust after Brasher's death in 2003. The Welshman, born and raised in Corris on the southern slopes of Snowdonia, held several other posts in sport. He taught physical education at Isleworth Grammar School, and was the chief instructor at the National Mountain Sports Centre in Plas y Brenin in Snowdonia. He was vice chairman of the UK Sports Council for eight years and was inducted into the Welsh Sports Hall of Fame in 2007. Disley was inducted into the Welsh Sports Hall of Fame in 2007 and was also BBC Cymru Wales Sports personality of the year in 1955.